IT’S BEEN a very productive week in the vegetable patch, resulting in us munching on lots of lettuce, tomatoes, cucumbers and sweetcorn. Is it just me, or are things supposed to taste so much better when you have grown them yourself, because they do! We have also had some tasty plums too, it’s just a shame that there were only 10 of them and they were the size of grapes. I know it was 40+ years ago, but I don’t ever remember the plums I used to borrow from the local orchard being that small. Maybe it’s just because I was so much smaller back then! It won’t be long before we are picking the apples too. Well, we’ve had a bit of a situation this last week as we were weeding the banks of the ditch which runs through the garden. We had one of our sons over helping and as he was pulling up some very tall weeds, which have been referred to in previous ramblings as flowers, I could see out of the corner of my eye that he was waving his hands around and getting exasperated with how many flies were around him. It was only when one of these ‘flies’ stung him on his hand, that he realised that they were in fact wasps and he had disturbed their nest. I stood and watched, open mouthed for a few seconds, wondering why he was spontaneously performing ‘River Dance’ in the garden, when I didn’t even know he’d been having lessons. Thankfully, it wasn’t long before I realised that he had in fact been stung in several times including multiple times on his feet and leg. As a result of this misfortune we decided to vacate that part of the garden and commenced weeding further down the bank. I have subsequently purchased the necessary materials I require, in order that the wasps can be encouraged to move on and rebuild their home in a more appropriate location. Once again, more lessons have been learned this week on the farm. The hens are generally very well behaved and have been going to bed around 9pm over the last few weeks, except when it’s raining, at which time they will make a move a little earlier. Unfortunately this isn’t always the case, as I have witnessed over recent weeks. I could set my clock by the older hens bedtime, but why is it that the younger hens are like typical teenagers and start sparking into life and decide it’s party time, just when you want them to go to bed. They just give me a look as if to say, “Are you kidding, have you seen the time!” I have learned through personal experience that trying to round the hens up for bed is more work than I’m willing to put in at that time of night, so I just take the easy option and wait until they see sense and take themselves off to bed. I wasn’t even properly awake this morning as I staggered out the door, excited for the day ahead. Without even thinking about it I stood on the front step and slid my left foot into my boot, squelch, went my foot and immediately pulled my foot out. I picked the boot up and before I even tipped it upside down I knew what was lurking in the depths. Mr.Toad had snuggled down in there for the night. Luckily, he was still in one piece and hopped away merrily, after a few pictures, of course. 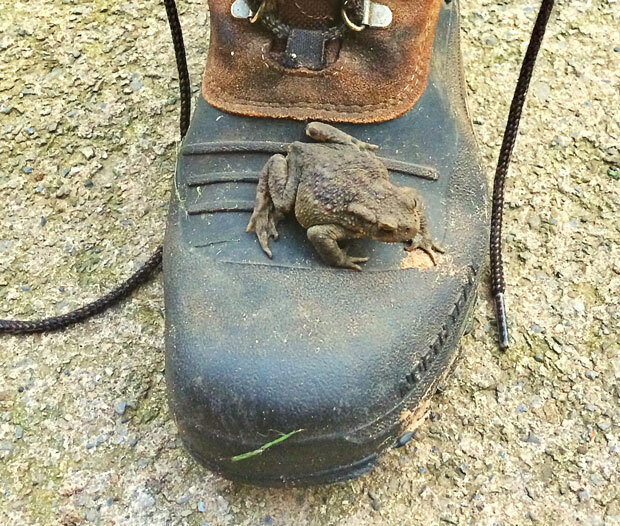 The lesson learnt, always check your boots!